Going to Le Rivage is like going back in time twenty years ago: that is how I would characterize this restaurant located in Theater Row. 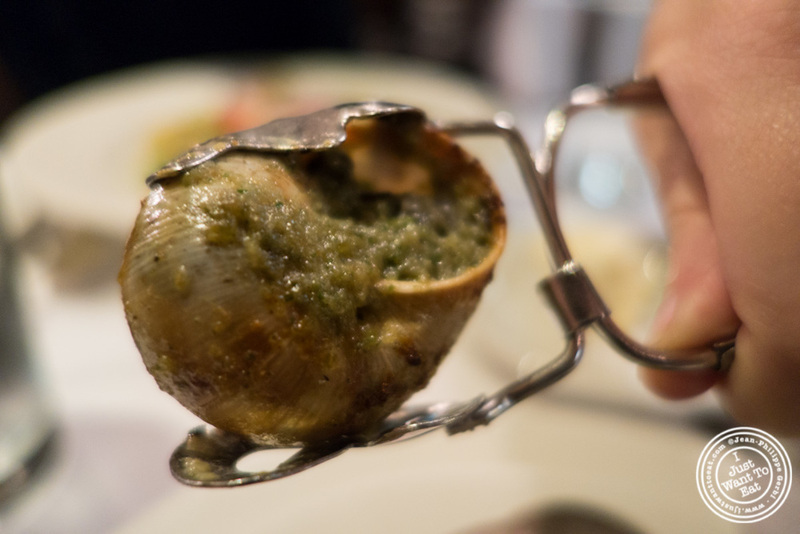 I definitely wanted to go when I saw that they serve two of my favorite traditional French dishes: escargots and frog legs (cuisse de grenouille). The restaurant has few sections: a small space at the entrance. Few tables on the left, across from the bar. I saw the menu few weeks ago and what I did not notice is the pricing. We could only order from the prix-fixe. $39 for an appetizer, an entree, a dessert and a coffee. The thing is that this was the pre-theater menu. After 7:30pm, they serve one that is slightly different for $25. So, if you go early, you pay more, that is contrary to what most restaurants are doing, trying to attract early dinners. Then, for few items, you pay extra; that is not surprising, but you will see while reading this post that they push a little bit the envelop. For appetizers, Jodi ordered their green salad with artichokes. Nice salad, a bit overdressed. It was the first time I saw artichokes presented this way. 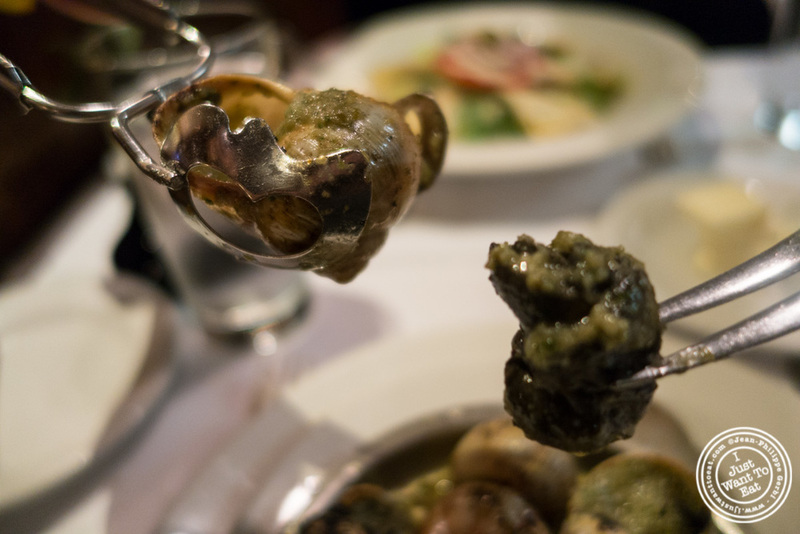 On my side, I ordered the escargots, prepared with garlic and butter. They were served with their shell, that is pretty rare here. Fortunately, they provide the necessary equipment to extract the animal. The dish was just ok, having too much breading in it. I was surprised to see that they served only six of them, considering that there was a supplement of $5. As you can see, the sides the dishes came with were the same: potatoes, cauliflower and Brussels sprouts. Well, we definitely did not enjoy the sides that were undercooked. At least, the quiche was good: fluffy, light, with lots of cheese. The frog legs? Way too much garlic, otherwise good. For dessert, Jodi got the Napoleon. And I got the poire Hélène as they wrote on the menu, that is in fact poire belle-Hélène. It is a traditional French dessert made with a poached pear, vanilla ice cream, chocolate sauce and whipped cream. Trust me: it was definitely not made with the best ingredients; the pear was not ripe and the vanilla ice cream not very tasty. As for the Napoleon, it was standard and bought in a bakery from what I understand, nothing shocking there as many restaurants source their desserts in local bakeries instead of making them. So I believe you already guess what I think about Le Rivage...I would not go back. For the same price, I can get the same meal, a la carte, at Sel et Poivre, or a delicious experience at Jeanne et Gaston. If you like this post or the photos, feel free to share it or to write a comment! And Remember: I Just Want To Eat!